Are you interested in livening up your house or workspace with a little extra green? 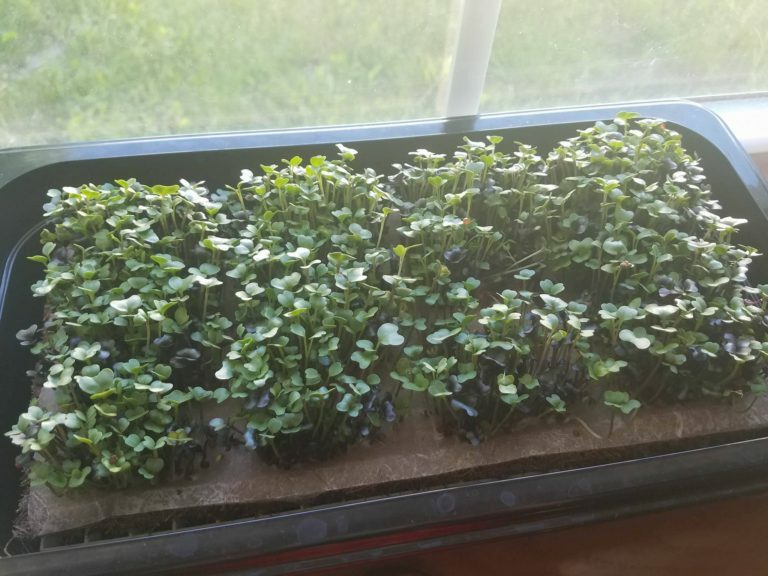 Have you wanted to grow some of your own produce at home but didn’t have the green thumb or weren’t sure where to start? I was in the same boat. I have always loved plants. I think having them around is a great form of self care. When I first got a job in the indoor agriculture industry, working for Agrilyst, I was excited to learn more about the hydroponic process and how to grow plants that are more useful than just cute decorations! It turns out that getting started with home hydroponics can be really overwhelming and takes a lot of research. Even though I’m working in the industry now, I’m still a newbie at this! 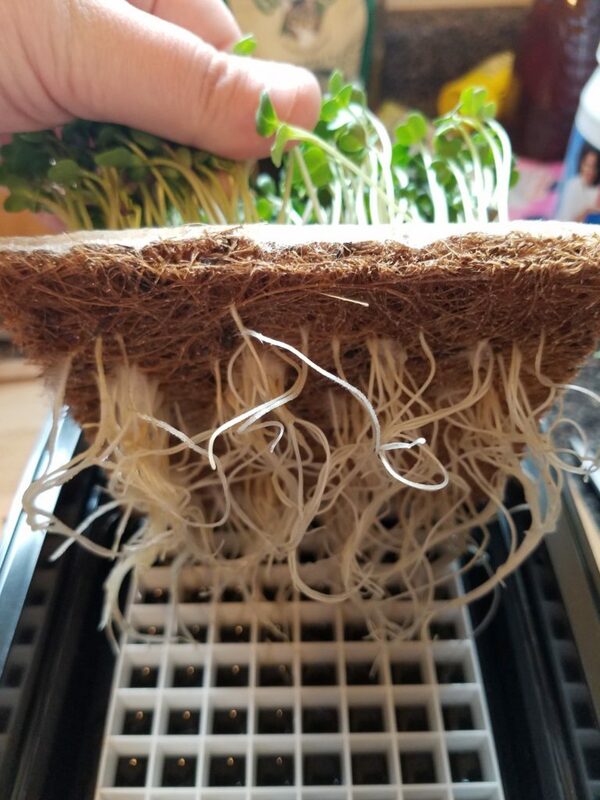 So I decided to get my feet wet, so to speak, by trying out some really easy, user-friendly, countertop sized consumer hydroponics kits – and passing on my thoughts about them via a series of reviews! Hamama was the kit I decided on for my first foray into hydroponics, mainly because the price point made it seem like a no-brainer. The other kits I was looking at were in the 60-100 dollar range, with $60 feeling like a pretty good deal. The Hamama microgrow kit only costs $14. Everything you need to get started, including shipping, ends up costing an even $30 – and that includes a whole month’s worth of “seed quilts,” which is Hamama’s method of planting and germinating. So why does it cost so much less? For one, it’s a lot lower tech than the other kits on the market. Of the four I’m testing, Hamama is the only one that doesn’t include any electronics at all. The microgrow kit itself is really exceedingly simple. It’s pretty much just two pieces of plastic that are designed to properly hold the seed quilts, which are the real product in my opinion. 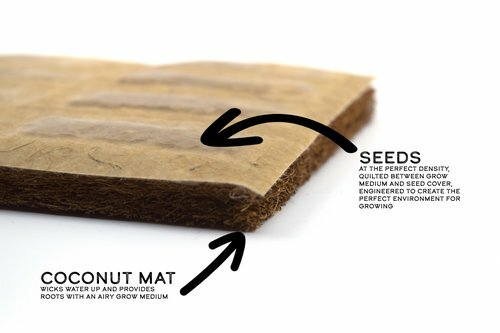 The seeds are built into a coconut mat which acts as a water retainer/grow medium and it makes it super easy to use. It’s only 7-10 days from beginning to harvest, depending on what you’re growing, which I found really rewarding when I was first starting out (and my other kits were barely sprouting by that point)! These seed quilts cost $14 for a set of three, which is meant to be a month’s supply if you plant them one after another. Another thing I love about Hamama is that you can sign up for a monthly recurring subscription box of new seed quilts, so you always have enough to plant! There are options to skip a monthly shipment and to pick and choose which varieties you want, with helpful reminder emails coming to your inbox right before you renew for the month. 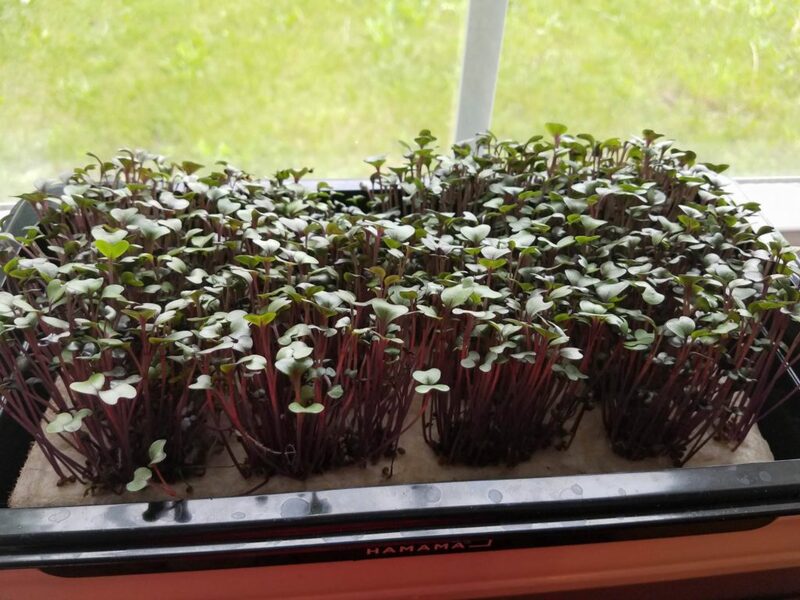 Currently there are only a few varieties to choose from – radish sprouts, salad mix sprouts and red cabbage sprouts – but they intend to have different options for each season and I’m excited to see what new options they offer this summer! Knowing how short the seed-to-harvest lifecycle was for Hamama, I was very excited to get started growing as soon as my kit arrived in the mail. I followed the simple instructions that were included with the kit, put it on my windowsill and waited. The recipe is simple: add water, add your seed quilt, peel off the cover after a certain number of days and then harvest after a certain number more days. It worked like a charm for me the first time! 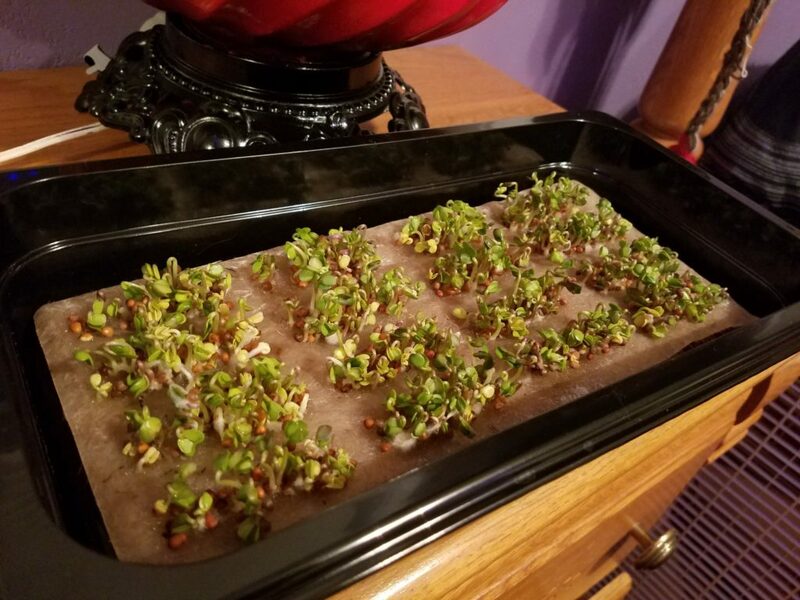 Day 4, we got sprouts! Looking good on day 6! 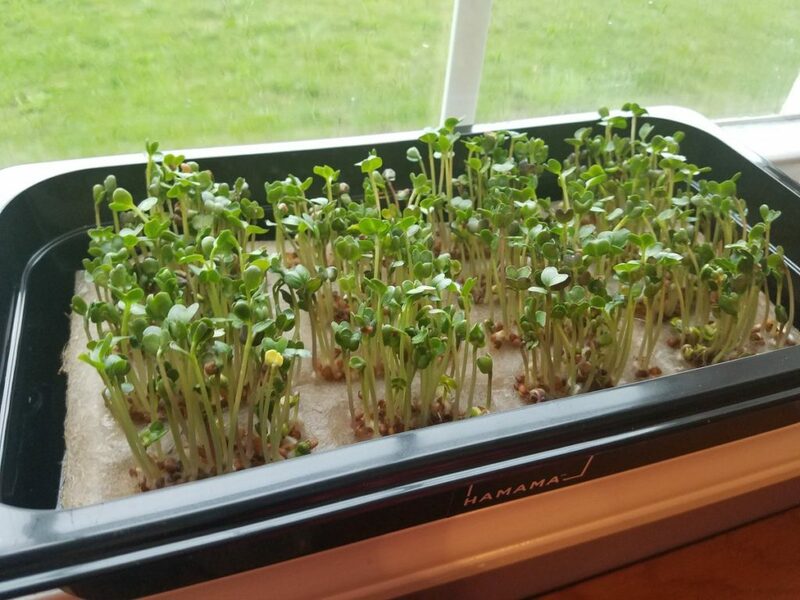 My radish sprouts were ready to harvest on the morning of day 8! 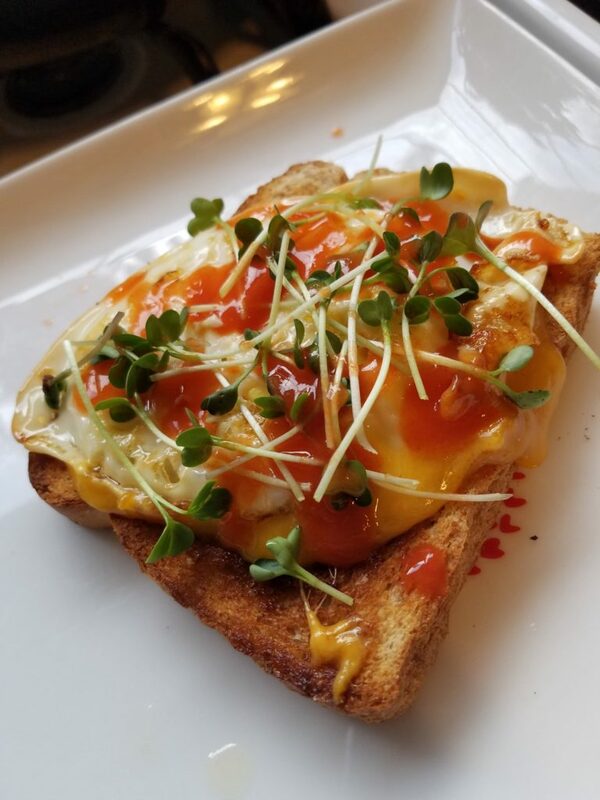 Only a week later, I was psyched to do my first harvest and sample some of my radish sprouts with my favorite meal of the day, breakfast! One of the pieces of the kit is a plastic grid that the seed quilt sits on top of. When I was first putting it together, I didn’t totally understand the purpose but once I did my first harvest, it completely clicked in my mind. This piece holds up the coco mat so the roots can grow nicely down into the water below. Look at my beautiful roots from my first harvest! It may be easy, but it’s not impossible to mess up. My second batch… didn’t come out quite so good. Here’s where I went wrong: The instructions note that when you peel the cover off of the seed quilt, you should also move it to an area where it will get sun. 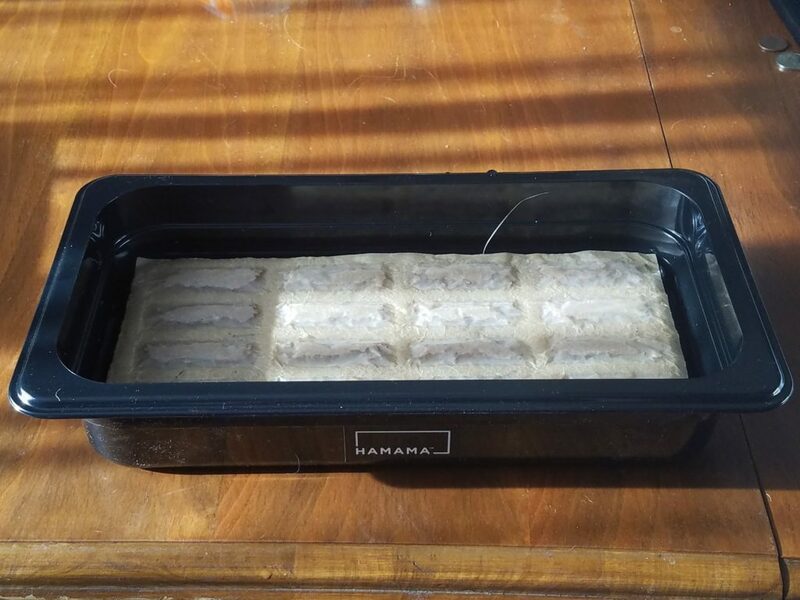 I contacted Hamama support and asked if it was okay for it to be in a sunny area for the entire lifecycle or if it was important to germinate in a darker place. They told me it was fine to be in sun the whole time but that I should make sure to check the water level and refill it if it got too low. They weren’t kidding! Spending the whole 10 days on my windowsill dried out part of the mat and that’s why the seeds in the middle weren’t able to germinate. Once I realized what I was doing wrong, my next batches came out much nicer. 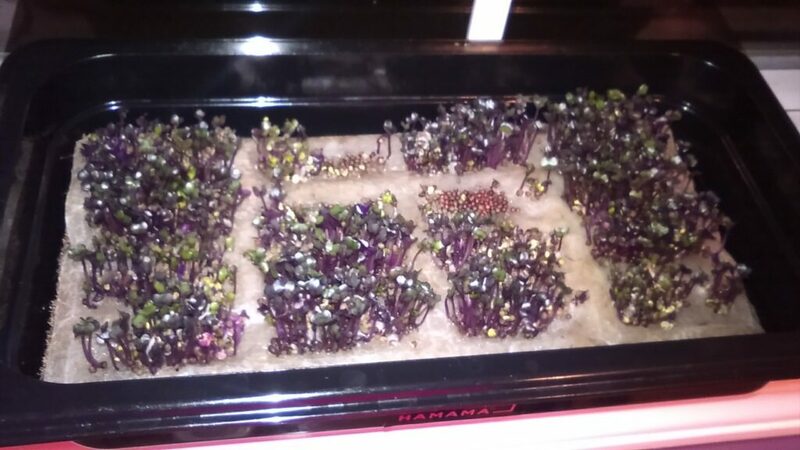 The red cabbage sprouts are a beautiful purple color! Hamama’s excellent customer service was a huge plus for me too. 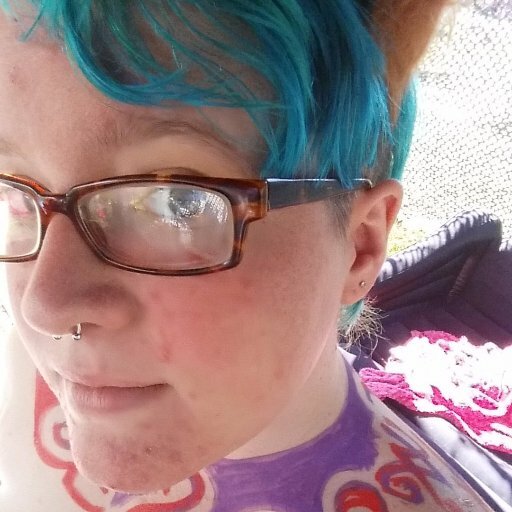 The fact that I was able to write a tweet and quickly get an answer was super helpful, but it was also a major confidence boost to know that I’d have someone to ask if I had any more questions. Plus they retweet me whenever I tweet photos of my sprouts, which I selfishly love because I’m obsessed with twitter. Overall, I found Hamama to be a really amazing beginner kit. 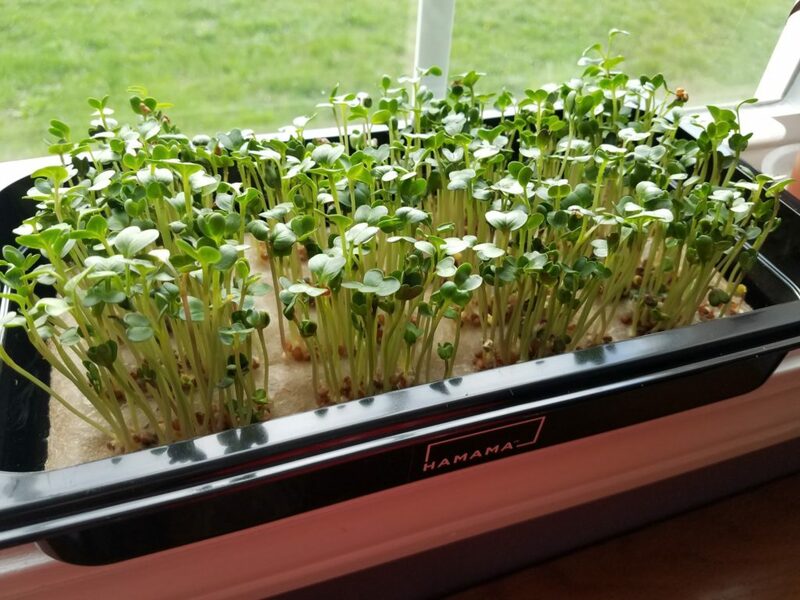 Going into this endeavor, I was nervous that I wouldn’t actually be able to grow anything successfully and being able to set up Hamama and see results immediately was super rewarding and helped me build some momentum! The fact that it’s so low tech has pros and cons; it’s easy to move around the house because I don’t have to plug it in, but there are constraints to where it can live because it doesn’t have a lamp and requires sunlight! I’m getting kind of sick of sprouts, so I’m excited to see what other varieties they offer in the future, but it’s still an easy way to get some green growing on my bedroom windowsill, which really brightens up my morning. At such a low price point, I’d say it’s worth it just for that, even if other kits are more viable for real food production! If you’re interested in trying out Hamama, you can order it here – and be sure to use JAMEYGROWS as your coupon code to get 15% off! 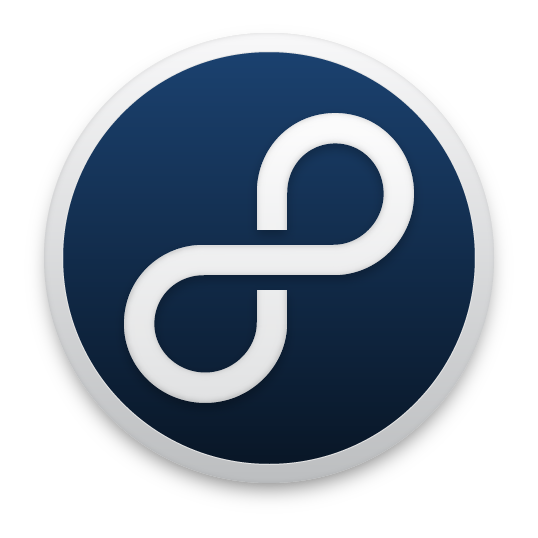 Stay tuned for more consumer hydroponic reviews coming soon! In the meantime, feel free to follow me on twitter where I post a lot of cute, in-progress pictures of my plants. Thank you so much for all the information! Can’t wait to get started!